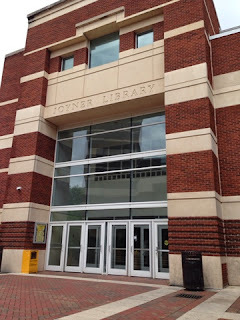 Last week (ish) I was lucky enough to attend the Paraprofessional Library Conference at ECU with some of my coworkers. I was pretty excited, it was the first conference of any kind I have been sent to for work and my inner book nerd was very antsy. We had some awful weather on our two hour drive up there, but luckily once we hit campus it cleared up nicely. It was great to attend the workshops and bond a bit more with my coworkers outside the library. 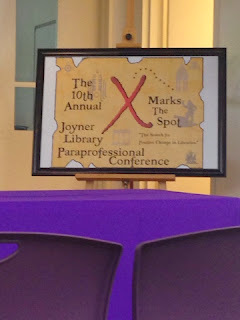 The main thing about a paraprofessional conference is that it is geared towards people like me.... people who work in libraries that are not necessarily librarians. To be called a librarian you need to have your MLS (Master of Library Sciences), which I obviously do not have, hence the reason I am a Library Technician. I did four different workshops that I found pretty interesting. The first was about salvaging old photographs that can get damaged in your facility due to flooding/storms/leaks/etc. We do live in Eastern North Carolina, it isn't that far fetched! They showed us techniques that can save a good number of photographs that are important to our collection if we are able to do so. They even showed us some before and afters from libraries in New Jersey after Hurricane Sandy and what they were able to salvage. My next workshop was about Murder Mystery Theatre... something another library a county over does once a year for the community. I really enjoyed their presentation. For practically no budget they manage to pull off some really entertaining performances! Theatre and Libraries combined? You know I am SO there! I know MCCS here at Lejeune does something similar, but it is dinner theatre and not as interactive as the one we learned about nor is it solely a library production. But something to consider for sure! After lunch I attended a basic photography workshop that had me riveted the whole time... other people maybe not so much. I am a total geek for this stuff and I want to learn to take better pictures so I really enjoyed it. It made me really itch for a DSLR too! My last workshop was about stress relieving work outs you can do at work. Mainly it was stretching and focusing energies on certain tension spots but I did learn one or two I could do behind the reference desk and not look like a total spaz! Overall I had a really great time. As one of my coworkers said during one of our breaks as we lounged in the sunny courtyard, "I imagine this is what it would have been like to go to college with y'all... it's kind of scary." 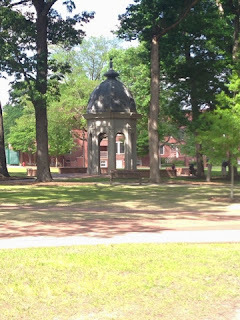 The campus was definitely beautiful, and I naturally ran through the ECU musical arches a few times before we had to drive back!